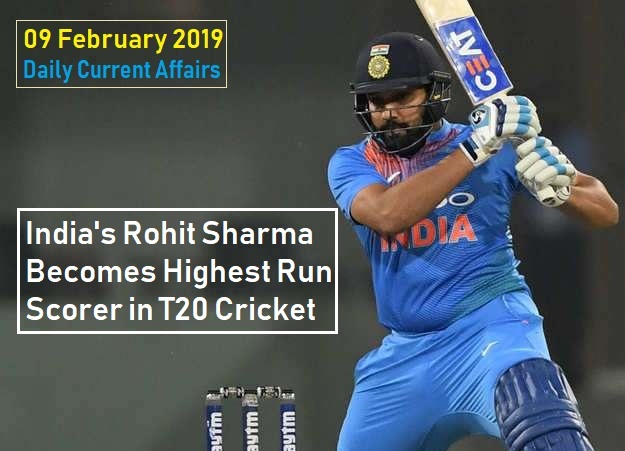 India's Rohit Sharma (31-year) has become the highest run scorer in the Twenty20 International history while playing against New Zealand in Auckland. Sharma overtook New Zealand's Martin Guptill, who has scored 2,272 runs in 74 innings in T20I. The top-seeded Indian squash player Ramit Tandon defeated Egyptian Mohamed El Sherbini in the finals to win PSA challenger squash Tour event ‘Seattle Open’. He rose to his career high ranking of 58 in the latest February list. Mr. Tandan won his first PSA title in the new year and fourth title overall in his career. According to Australia’s cricket board, Former captain Ricky Ponting (44-year) has been appointed as an assistant coach of Australia's men's team for the 50-over World Cup in England. Ponting will work with Australia's batsmen for the World Cup campaign. Now, current batting coach Graeme Hick preparing the side for the Ashes tour in England (held in August). According to the International Paralympics Committee (IPC), it will conditionally readmit Russia by next month. The ban will be lifted by 15th, providing the Russian Paralympic Committee (RPC) adhere to strict criteria. In August 2016 the IPC suspended the RPC because it was necessary and proportionate to the situation,they faced and essential to ensure a clean sport. Mr. Sanjiv Chadha (State Bank of India’s UK chief) has been honoured with the ‘Freedom of the City Of London’ in recognition of his contribution to promoting the bilateral relations. Mr. Chadha was nominated for the honour by Lord Mayor of London Peter Estlin and Sheriff Vincent Keaveny. Sanjiv Chadha took up the position in 2014. Director European Film Market (EFM) Matthijis Wouter Knol has inaugurated the Indian Pavilion at 69th Berlin International Film Festival (Berlinale) 2019 at Berlin, Germany (7th – 17th February). The stakeholders of EFM will actively consider participating in the Golden Jubilee year of IFFI. India Pavilion is being acted as a platform to popularize Indian Cinema in the overseas market and facilitate new business opportunities. Indian Mission in Berlin would undertake constant engagement in future with Indian and German stakeholders at the European Film Market. Ministry of I&B, in collaboration with Confederation of Indian Industry, is participating in the Berlin International Film Festival. An independent analysis by NASA & the National Oceanic and Atmospheric Administration have found that earth's global surface temperatures in 2018 were the fourth warmest since 1880. Globally, 2018's temperatures rank behind those of 2016, 2017 and 2015. It found that 2018 global temperatures were 0.79 degrees Celsius above the 20th-century average. Indian Coast Guard and the Airport Authority of India (AAI) has signed a Memorandum of Understanding (MoU) for coordination in the aeronautical and maritime search and rescue operations. The objective of the MoU to strengthening mutual interactions, interoperability and validating procedures during the conduct of search and rescue operations. Now, the operations will be conducted jointly by the Rescue Coordination Centre (RCC) Kolkata, Airport Authority of India (AAI) and Maritime Rescue Coordination Centre (MRCC) in Port Blair. India’s eight-point jump in 2019 from 44th position in 2018 is the highest increase among 50 nations mapped by the index. The Union Home Ministry banned the Tehreek-ul-Mujahideen (TuM) under the Unlawful Activities (Prevention) Act (UAPA). The central government believes that TuM is involved in terrorism as it has committed and participated in various acts of terrorism in India. Its members are getting financial as well as logistic support from their handlers based abroad. The TuM came into existence in 1990 with the objective of “liberation of Kashmir” and has been actively pursuing it by way of acts of terror. Today, The Bihar Governor Lalji Tandon and Union Agriculture Minister Radha Mohan Singh jointly inaugurated three-day Krishi Kumbh in Motihari. This is the largest Krishi Kumbh of Eastern India. The objective of Krishi Kumbh is to promote modern techniques and diversification in agriculture that could help in doubling farmers income. About two hundred different stalls in the fair will inform farmers about modern agricultural technologies. This Kumbh will be a meeting point for policymakers, government, media, industries and other stakeholders to share knowledge discuss problems and presenting solutions for geometric progression growth of the agriculture in India.